Synthetic peptide corresponding to Rat beta III Tubulin aa 400-500. This antibody clone [2G10] is manufactured by Abcam. Our Abpromise guarantee covers the use of ab78078 in the following tested applications. 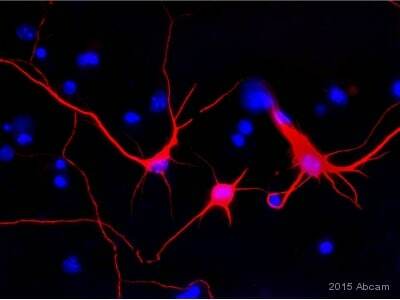 IHC-P Use a concentration of 0.2 - 1 µg/ml. WB Use a concentration of 1 µg/ml. Detects a band of approximately 50 kDa (predicted molecular weight: 50 kDa). Tubulin is the major constituent of microtubules. It binds two moles of GTP, one at an exchangeable site on the beta chain and one at a non-exchangeable site on the alpha-chain. TUBB3 plays a critical role in proper axon guidance and mantainance. Expression is primarily restricted to central and peripheral nervous system. Defects in TUBB3 are the cause of congenital fibrosis of extraocular muscles type 3A (CFEOM3A) [MIM:600638]. A congenital ocular motility disorder marked by restrictive ophthalmoplegia affecting extraocular muscles innervated by the oculomotor and/or trochlear nerves. It is clinically characterized by anchoring of the eyes in downward gaze, ptosis, and backward tilt of the head. Congenital fibrosis of extraocular muscles type 3 presents as a non-progressive, autosomal dominant disorder with variable expression. Patients may be bilaterally or unilaterally affected, and their oculo-motility defects range from complete ophthalmoplegia (with the eyes fixed in a hypo- and exotropic position), to mild asymptomatic restrictions of ocular movement. Ptosis, refractive error, amblyopia, and compensatory head positions are associated with the more severe forms of the disorder. In some cases the ocular phenotype is accompanied by additional features including developmental delay, corpus callosum agenesis, basal ganglia dysmorphism, facial weakness, polyneuropathy. (A-L) MHC (green) and β3-tubulin (red) co-immunostaining along the antero-posterior axis of the mouse soft palate at E13.5 (A-C), E14.5 (D-F), E16.5 (G-I), and P0 (J-L) at the level of the TVP and PLG (A, D, G, J), LVP (B, E, H, K), and PLP and SPC (C, F, I, L). Dashed lines indicate the outline of the palatal shelf and tongue epithelium. Arrows indicate the nerve fibers innervating the palatal shelves in a pattern complementary to the differentiated muscle, mainly located orally in the medial region. The schematic drawings indicate the orientation and the position of each section. Scale bars: 200μm. beta III Tubulin is detected with ab78078. 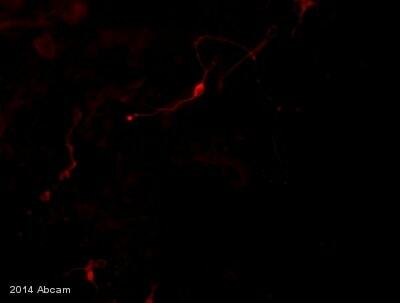 ab78078 staining beta III Tubulin (red) in mouse differentiated neural stem cells by ICC/IF (Immunocytochemistry/immunofluorescence). Cells were fixed with paraformaldehyde, permeabilized with 0.2% Triton X-100. Samples were incubated with primary antibody (5µg/ml in PBS + 3% BSA) for 16 hours at 4°C. An Alexa Fluor® 568-conjugated donkey anti-mouse IgG polyclonal (1/1000) was used as the secondary antibody. Blue - DAPI nuclear counterstain. Lanes 1 - 4: Merged signal (red and green). Green - ab78078 observed at 50 kDa. Red - loading control, ab181602, observed at 37 kDa. ab78078 was shown to specifically react with beta III Tubulin in wild-type HAP1 cells as signal was lost in beta III Tubulin knockout cells. Wild-type and beta III Tubulin knockout samples were subjected to SDS-PAGE. ab78078 and ab181602 (Rabbit anti-GAPDH loading control) were incubated overnight at 4°C at 10 μg/ml and 1/20000 dilution respectively. Blots were developed with Goat anti-Mouse IgG H&L (IRDye® 800CW) preabsorbed ab216772 and Goat anti-Rabbit IgG H&L (IRDye® 680RD) preabsorbed ab216777 secondary antibodies at 1/20000 dilution for 1 hour at room temperature before imaging. 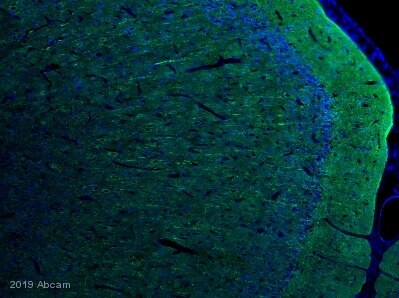 IHC image of ab78078 staining beta III Tubulin in Human cerebellum formalin fixed paraffin embedded tissue sections, performed on a Leica Bond. The section was pre-treated using heat mediated antigen retrieval with sodium citrate buffer (pH 6.0 epitope retrieval solution 1) for 20 mins. The section was then incubated with ab78078, 0.5μg/ml, for 15 mins at room temperature and detected using an HRP conjugated compact polymer system. DAB was used as the chromogen. The section was then counterstained with haematoxylin and mounted with DPX. No primary antibody was used in the secondary only control (shown on the inset). Overlay histogram showing SH-SY5Y stained with ab78078 (red line). The cells were fixed with 4% paraformaldehyde (10 min) and then permeabilized with 0.1% PBS-Tween for 20 min. The cells were then incubated in 1x PBS / 10% normal goat serum / 0.3M glycine to block non-specific protein-protein interactions followed by the antibody (ab78078, 1µg/1x106 cells) for 30 min at 22°C. The secondary antibody used was DyLight® 488 goat anti-mouse IgG (H+L) (ab96879) at 1/500 dilution for 30 min at 22°C. Isotype control antibody (black line) was mouse IgG1 [ICIGG1](ab91353, 2µg/1x106 cells) used under the same conditions. Acquisition of >5,000 events was performed. This antibody gave a positive signal in SH-SY5Y cells fixed with 80% methanol/permeabilized in 0.1% PBS-Tween used under the same conditions. IHC-FoFr image of Beta III tubulin (ab78078) staining on rat hippocamus sections. The sections used came from animals perfused fixed with Paraformaldehyde 4%, in phosphate buffer 0.2M. Following postfixation in the same fixative overnight, the brains were cryoprotected in sucrose 30% overnight. Brains were then cut using a cryostat and the immunostainings were performed using the ‘free floating’ technique. ab78078 staining beta III Tubulin in NGF-differentiated PC12 cells. The cells were fixed with 100% methanol (5min) and then blocked in 1% BSA/10% normal goat serum/0.3M glycine in 0.1%PBS-Tween for 1h. The cells were then incubated with ab78078 at 1μg/ml and ab6046 at 1µg/ml overnight at +4°C, followed by a further incubation at room temperature for 1h with an AlexaFluor®488 Goat anti-Mouse secondary (ab150117) at 2 μg/ml (shown in green) and AlexaFluor®594 Goat anti-Rabbit secondary (ab150088) at 2 μg/ml (shown in pseudo color red). Nuclear DNA was labelled in blue with DAPI. IHC image of ab78078 staining beta III Tubulin in rat cerebellum formalin fixed paraffin embedded tissue sections, performed on a Leica Bond. The section was pre-treated using heat mediated antigen retrieval with EDTA/Tris (epitope retrieval solution 2) for 20 mins. The section was then incubated with ab78078, 0.5μg/ml, for 15 mins at room temperature and detected using an HRP conjugated compact polymer system. DAB was used as the chromogen. The section was then counterstained with haematoxylin and mounted with DPX. No primary antibody was used in the secondary only control (shown on the inset). Neuron specific beta III Tubulin - Neuronal Marker was immunoprecipitated using 0.5mg Mouse Brain whole tissue lysate, 5µg of Mouse monoclonal [2G10] to Neuron specific beta III Tubulin - Neuronal Marker and 50µl of protein G magnetic beads (+). No antibody was added to the control (-). Proteins were eluted by addition of 40µl SDS loading buffer and incubated for 10min at 70oC; 10µl of each sample was separated on a SDS PAGE gel, transferred to a nitrocellulose membrane, blocked with 5% BSA and probed with ab78078. 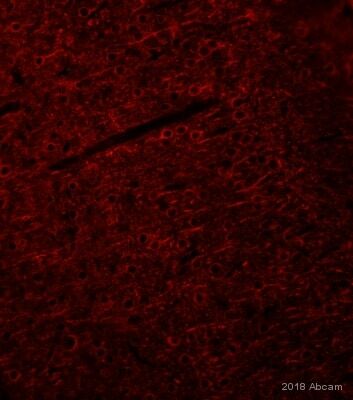 Band: 50kDa: Neuron specific beta III Tubulin - Neuronal Marker. Immunohistochemical detection of Neuron specific beta III Tubulin using ab78078 on formaldehyde fixed dogfish/catshark PNS tissue sections. Antigen retrieval step: heat mediated in citric acid. Blocking: 1% BSA for 10 mins @ rt°C. Primary antibody ab78078 incubated at 1/1250 for 2 hours. Secondary Antibody: anti mouse IgG conjugated to biotin @ 1/200 This is a composite image of neuronal cell bodies and fibres; the upper image uses coloured arrowheads to indicate positive PNS components: cell bodies (black), L/S (green) and T/S (red) nerve fibres of what appear to be three Ganglia. Note that the L/S fibres do not appear as well-stained as the T/S fibres. The lower image shows what appears to be a linear sequence of single nerve cells and their processes within the core of a gill. Immunohistochemistical detection of Neuron specific beta III Tubulin antibody using ab78078 on formaldehyde-fixed paraffin-embedded marmoset cerebellum sections. Antigen retrieval step: Heat mediated in Citric acid pH6 buffer. Permeabilization: No. Blocking step: 1% BSA for 10 mins @ rt°C. Primary Antibody used at 1/1000 incubated for 2 hours in TBS/BSA/azide. 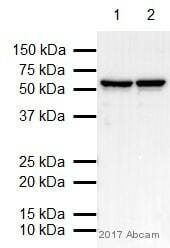 Secondary Antibody: anti mouse IgG conjugation to biotin (1/200). Immunohistochemistical detection of Neuron specific beta III Tubulin using antibody (ab78078) on formaldehyde-fixed paraffin-embedded human medulla oblongata sections. Antigen retrieval step: Heat mediated in citric acid HIER buffer. Permeabilization: No. Blocking step: 1% BSA for 10 mins @ rt°C. Primary antibody dilution 1/250 incubated for 2 hours in TBS/BSA/azide. Secondary antibody: anti Mouse IgGs conjugated to biotin (1/200). This section was cut from an anonymous autopsy P.wax block that is over 20 yrs old, so I would expect variable positivity when compared with more recently sampled tissues (giving higher dilution factors, such as I obtained with fresh mouse/rat CNS blocks.) Transverse-cut axons stain very intensely longitudinal nerve processes and cell bodies are not so heavily stained but are still easily seen. IHC image of ab78078 staining in mouse brain formalin fixed paraffin embedded tissue section, performed on a Leica BondTM system using the standard protocol F. The section was pre-treated using heat mediated antigen retrieval with sodium citrate buffer (pH6, epitope retrieval solution 1) for 20 mins. The section was then incubated with ab78078, 1µg/ml, for 15 mins at room temperature and detected using an HRP conjugated compact polymer system. DAB was used as the chromogen. The section was then counterstained with haematoxylin and mounted with DPX. 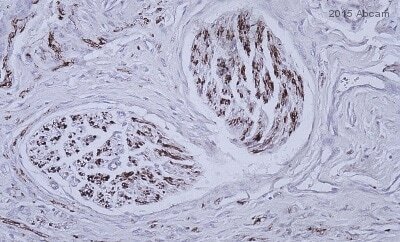 ab78078 staining beta III Tubulin in Chicken e6: developing eye tissue sections by Immunohistochemistry (IHC-P - formaldehyde-fixed, paraffin-embedded sections). Tissue was fixed with formaldehyde and blocked with 1% BSA for 10 minutes at room temperature; antigen retrieval was by heat mediation in a citrate buffer. Samples were incubated with primary antibody (1/1250) for 2 hours. A Biotin-conjugated Goat anti-mouse IgG polyclonal (1/200) was used as the secondary antibody. 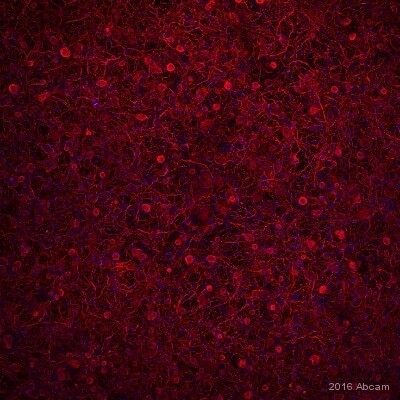 Immunohistochemistical detection of Neuron specific beta III Tubulin antibody [2G10] using ab78078 in formaldehyde-fixed paraffin-embedded quail embryo eye sections. Antigen retrieval step: heat mediated in citric acid pH6 buffer. Blocking step: 1% BSA for 10 mins @ rt°C Primary antibody incubated at 1/1250 for 2 hours in TBS/BSA/azide. 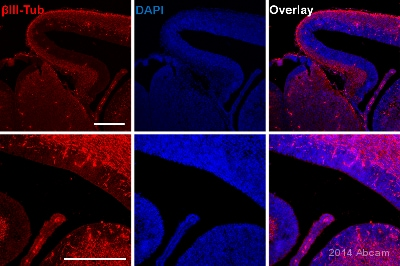 Secondary antibody: anti-Mouse IgG conjugated to biotin used at 1/200. In this image, the lining cells of the hyaloid artery are positive. Excellent neural component specificity: even small fibres outside of the cartilage model of the orbit are clearly demonstrated. Publishing research using ab78078? Please let us know so that we can cite the reference in this datasheet.